As it is the start of a new year I am setting myself a goal - a resolution if you will. Each month I would like to try and take 1 photo I am really proud of to add to my portfolio. I hope each photo will say something about the time of year and the place it was taken. When December comes around it will be interesting to see what I have come up with and I hope I have twelve images that I am really proud of. This is the first time I have set myself a photographic goal over the course of a year, and I hope it will encourage me to keep getting outside and exploring the world around me. During the Christmas break Masae and I went to stay with Robyne and Ken in Australia (Masaes Australian Mum and Dad). It surprised me how early they got up in the morning everyday. It is something I have often thought I need to do myself. One morning we got up and went for a walk with Robyne and it reminded me how nice it is to wake up with the world and not with everyone else. I loved that feeling and it is something I want to carry forward to help with my photography. Once we got back from the walk it amazed me how much time there was left in the morning! Not only is it great to be outside in the morning, you can do so much more when you get back home. I love the beauty of a sunset but usually I feel distracted even if it is amazing to look at. It might be everything that has gone on in the day or the location itself, I feel like I have a hard time to settle my mind. The time before and during a sun rise however is completely different I feel like my mind is calm and the world is calm. I can focus and feel as well as see the beauty around me, I hope that will come through in the photos I take over the coming year. As I get used to waking up earlier and earlier I am going to start carrying my camera more. One thing I am very aware of however is the feeling of having to carry my camera versus wanting to carry it. Pressure is frustrating and putting pressure on yourself is never good. Having a goal is good but I don’t think it should consume you. When I feel I want to take a photo I will and all the other times I will just enjoy being outside and hopefully being with Masae if she can wake up in time ha! I think that will do for now! If you have any goals set for the year good luck with them and what ever they may be I hope you achieve them! Thank you for reading see you next time! Wow 2018 is nearly over! This year has gone by so fast. Thank you to everyone that helped make this year so much fun! Two exhibitions have gone by, there is 1 more at the end of January in Osaka which we are looking forward to. Masae and I spent Christmas in Australia with Robyne and Ken. Masae calls them her Australian Mum and Dad because they are so close. It was the first time I met them and they are both amazing people, thank you so much for welcoming me in to your family. I love Australia and cannot wait to come back! I took my camera with me and I did take a few photos however I felt like I just wanted to relax and enjoy myself so there. Sometimes it is better to just be in the moment and experience everything around you, instead of focussing on taking photos. I needed the break and I hope it will help me going forward into 2019. I have no idea what to expect in 2019 but I aim to try and continue the momentum and enjoyment from 2018 on into the future. Thank you everyone once again for an amazing year! See you soon! Left to right Ken, Robyne, Masae, Mark. Outside Kens and Robynes home in Australia. Nagoya exhibition finished and looking forward to Osaka. 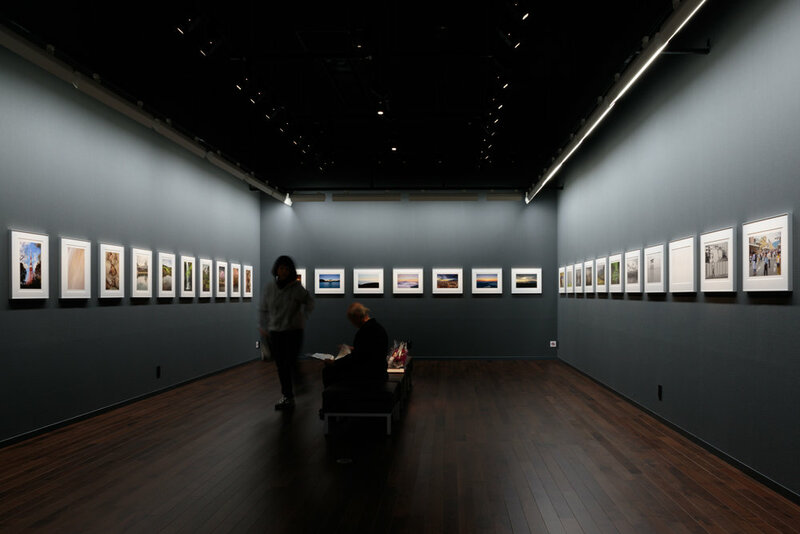 Wednesday the 5th of Decemeber 2018 marked the end of the exhibition at Canon Gallery in Nagoya. It was a fantastic experience. Before the exhibition began we had thought that it would be a lot quieter than Tokyo, we were very wrong. The response to the exhibition was amazing. Masae and I cannot thank everyone enough who came to see the exhibition. We met many many people of all ages, made new friends and many old friends came to see us as well. Some people came from a really long way. People from Shiga prefecture and friends from Takayama came, that is amazing thank you all for travelling such long distances and taking time to look at my art and see us, we are extremely grateful and humbled by your support. Thank you to everyone, the people at Canon, the people that visited, and thank you Masae you are the biggest help and support to me. Nagoya you are amazing and me and Masae cannot wait to come back! Now there is a little break and then the exhibition in Osaka will start at the end of Janauary next year (which is just around the corner - crazy!) . I am super excited for it to start as it is our home town. We are looking forward to seeing you all there! Wow day two of the exhibition at the Canon Gallery in Nagoya is over and I am extremly humbled by the people that visited. The warmth and enthusiasm towards my work they gave me was overwhelming. One guy Motoki came all the way from Shiga prefecture to see the exhibition because he thought he could not make it to the exhibition in Osaka, amazing! Me and Masae spoke to him for quite a while and we made a new friend. There was a professional power boat photographer who was really into the work and we spoke about all types of photography. Some school children came to see the exhibtion as they go to Canon to learn about the cameras and what Canon does. They were very sweet and enjoyed looking at the photos. Masaes Mum came all the way from Fukuyama to help (Thank you so much!) and brought her friend Hisami who lives in Nagoya. So many characters from all walks of life, they all liked different photos and had all different opinions. Some people say an exhibition should only be one type of work but I am glad my exhibition is varied but coherent that many different people come and leave enjoying what they have seen. Yesterday some friends from Hong Kong came to the exhibition (Tony, Winnie) and their friend Kyoko. I am so happy you could make it! Thank you so much for the flowers they are pride of place on the table in the middle of the exhibition! We look forward to seeing you again. After the exhibtion in Ginza which was very busy I had thought that the exihibiton in Nagoya would be very quiet and even though it is not as busy as Ginza I am still shocked by how many people Masae and I are meeting. We are very tired at the end of everyday not because of stress but because of how much fun we are having on this crazy journey. Thank you to everyone that we have seen so far you are all amazing and I look forward to the days to come. Canon Exhibition in Nagoya starts tomorrow! Hello everyone, I just wanted to say that the Canon Exhibition in Nagoya will start tomorrow (29/11/2018) and will run until (05/12/2018). I am super looking forward to seeing what the reaction will be to it and meeting new people and seeing my friends too. I will post more from the days ahead hopefully in the evenings. But before all that the day before we came to Nagoya I had the oppotunity to photograph some of the Autumn/Fall colour around near where I live in Japan and just wanted to share a photo from the trip. I hope you like it and I will add more to my Galleries in the coming days. Thank you very much for reading and see you again very soon! The end of the exhibition in Ginza Tokyo. Next stop Nagoya! 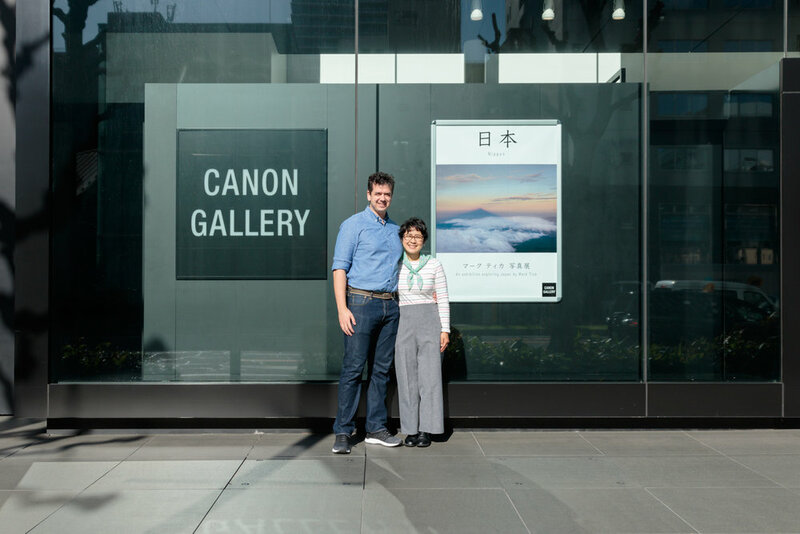 Yesterday the 8th November 2018 was the last day of my exhibition in Ginza Tokyo. It was one of the most fulfilling things I have ever done in my life. We met so many people from so many walks of life it was so nice to talk to them and see what they thought about my exhibition. Some people came back a second time! The staff at Canon were so helpful, kind and welcoming to me and Masae we made a lot fo new friends. We have to thank Shimbo-san, Akita-san, Furusawa-san, Hayashida-san, Iwata-san you are all amazing and the exhibition would not have been the same with out you. Thank you for believing in me and Masae. Thank you to Frame-man and Iwata-san for doing the mounting and matting, the prints looked incredible hanging on the wall! I feel kind of sad that it is over but ultimately I am filled more with happiness that I believe the exhibition was a success. It did not matter weather it was Sunny or pouring with rain there was always people looking at the prints. The next stage is just around the corner and I hope we get to see many more people. Akita-san, Masae, Me and Shimida Maki-san. Furusawa-san, Masae, Me, Hayashia-san, Iwata-san. That is how I chose to start the introduction to my very first photography exhibition that is to be held at Canon’s Gallery in Ginza Tokyo. Over the coming weeks and months it will be in Tokyo, Nagoya and Osaka. I hope to use the start of this blog as a way to document the adventure from start to finish. I thought starting this blog in the same way as my exhibition would be fitting. On Thursday 01/11/2018 my photos will be on the walls of a gallery in Tokyo. I never thought that would happen to me and I feel extremely lucky to have this opportunity. I have to thank Masae my wife for believing in my skills as a photographer and giving me the confidence to submit my portfolio, without her I would not be writing this. It has been a long and exciting road to get here but it is finally just around the corner. On Wednesday we go to the gallery to hang the photos in the evening and I am very much looking forward to that. I love printing my work I believe photos are objects that you can pick up and feel. It has been a lot of work but I am really happy with the results and I hope the people that come to view the photos will feel the care that was put into each print. Once the exhibitions are complete I hope to use this blog to share some information and thoughts about photography from my point of view. I will post the photos from the exhibitions into my galleries on here. Thank you very much for reading and I hope to see some of you at the exhibition!